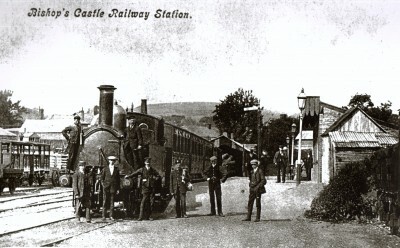 In 1860, tradesmen of Bishops Castle met at an inn in Craven Arms to discuss the formation of a railway to link Bishops Castle with Craven Arms. 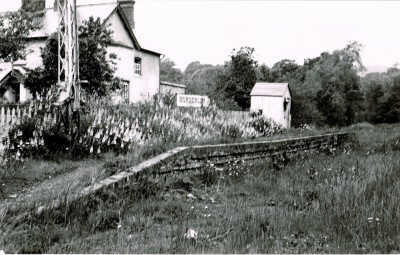 The line from Bishops Castle was to run to Lydham Heath, which would be the junction to Bishops Castle, with the line continuing in a westerley direction to connect with the Cambrian Railway near Montgomery Station with a short spur running up to Montgomery Town. 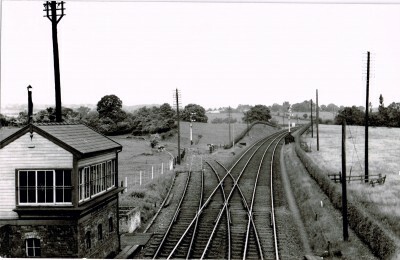 It was also proposed to form a branch line from Chirbury to Minsterley but, because of financial difficulties, these two sections were never built. 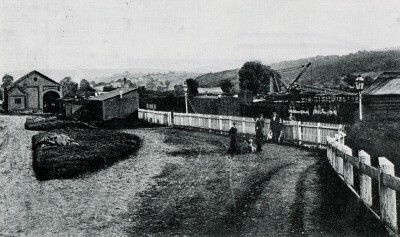 The Act of Parliament for the contstruction of the line was obtained in 1861, the company then proceeded to appoint the well known Railway Contractor, Thomas Savin, to build the line. Work started but did not proceed very well and it was decided to file a Bill of Chancery against Mr Savin to the amount of £20,500 that had been advanced to him in pursuance of the agreement. The Bishops Castle Railway Company won and then proceeded to appoint a local contractor, a Mr G Morris from Plowden, to build the line. This he did and to a high level of workmanship, contructing the line and all bridges to accomodate double track if neede at a later date. By October 1865 the line was completed and ready for operation and it opened for traffic on October 24th 1865 without having obtained the required approval from the Board of Trade. Approval was eventually obtained early in 1866 and , subject to a number of conditions, the company recommended operation. 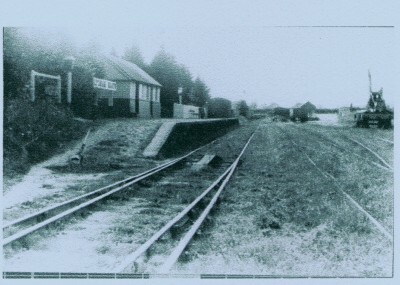 It was not long before the line wasin financial difficulties preventing the construction of the extension to Montgomery. On January 23rd 1867, a sale by auctionof property belonging to the company was held at the George Hotel in Shrewsbury. 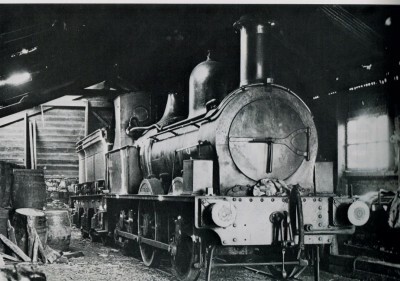 The catalogue included two locomotives and all the rolling stock. 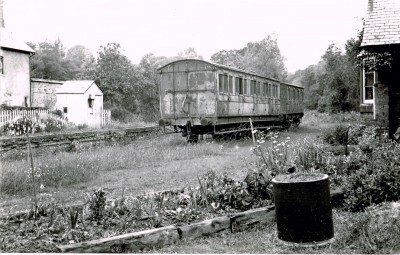 The rolling stock was purchased by the Midland Wagon Co. who had works in Shrewsbury and had built much of the stock. It was they who, with the debenture holders, appointed a Receiver to run the concern. 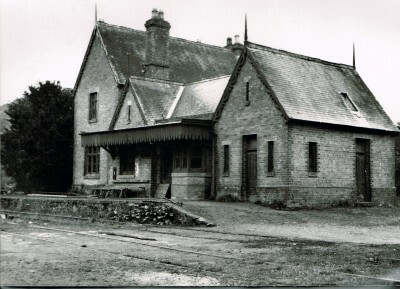 The Railway Company remained in receivership for the remainder of its life and closed in 1935. 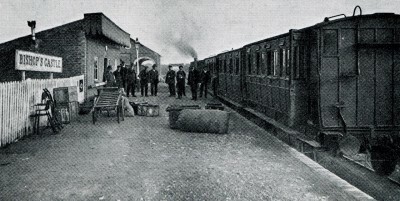 That the railway continued at all was largely due to the goodwill shown to it by local landowners (who for the most part were owed money by the railway). The railway lurched from one crisis to another, all linked to money, with the line being closed by baliffs in 1877 becuse of an unpaid bill. During the Great War a large quantity of timber was carried and the Company paid its one and only dividend to shareholders. From 1928 the Company obtained a bus, using it on occasions to replace or even in competition with the trains. 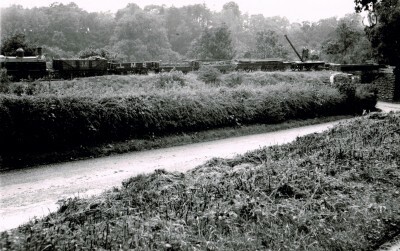 By 1935, the BCR Defence Fund that had been formed to support the railway, was exhausted. There was not enough money to cover expenses and the Receiver was withdrawn. Operations were suspended on Saturday April 20th 1935. All goods waiting transit were cleared with a large amount of round timber included. 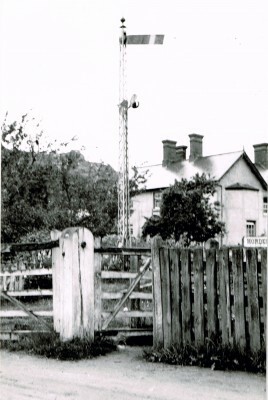 There were two timber cranes at Bishops Castle, one at Plowden and the Company's mobile crane was used at Lydham Heath. 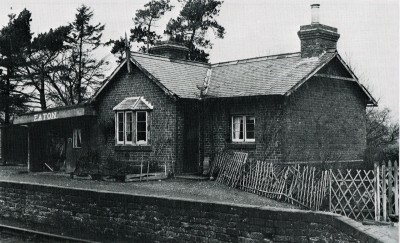 This work took a month to complete and the line fell into a state of slumber for approximately six months before demolition commenced at Bishops Castle. 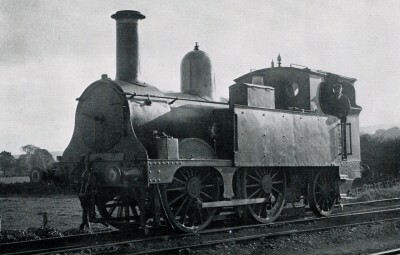 A small staff of five, ex-Bishops Castle railway men carried out the demolition work using the locomotive Carlisle with No.1 (Tankie) having been put into a siding at Plowden to await cutting up. The final demolition train left the line at Stretford Brdige Junction on Sunday 21st February 1937. 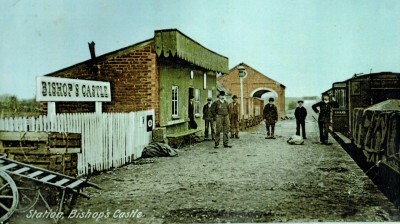 Carlisle was cut up at Craven Arms two weeks later. All the scrap metal was purchased by Rollanson & Co. with most of the rails finding their way to Birkenhead where they were used by the Cammel Laird ship yard in the construction of HMS Prince of Wales, a battleship that had distinguished service in WW11 before being sunk off Malaya by Japanese torpedo aircraft on December 10th 1941. The sleepers were sold too, but proved less of a bargain since so many were rotten and disintergrated on being lifted. It was also found that some, put in as aa emergency repair, were in fact sprouting having been cut green from the lineside. 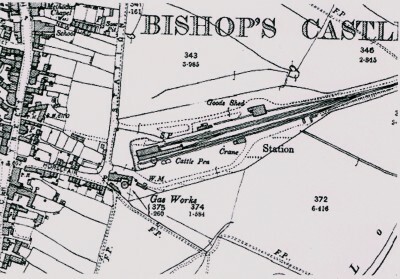 1875 map showing Bishops Castle Railway station. 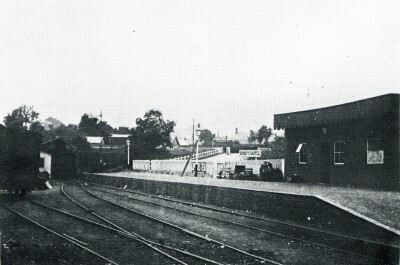 Note the unusual position of the turntable situated halfway along the main platform. 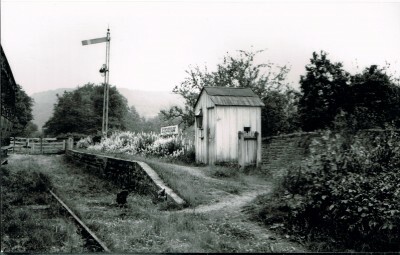 View of Bishops Castle station from the opposite direction. Lovely photo of "Carlisle" with all her crew. 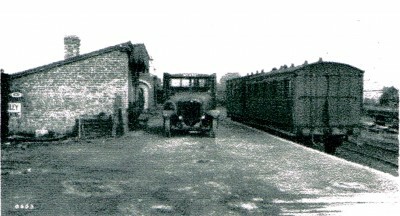 Nice photo dating from 1928 of the Bishops Castle Railway bus on one of the station platforms. 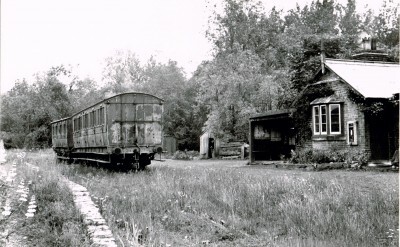 Photo of Lydham Heath station showing the mobile crane on the right for loading timber. 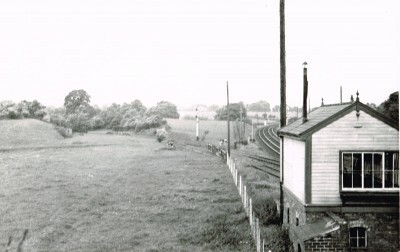 Eaton station photo looking rather sad, date probably late 1930's. 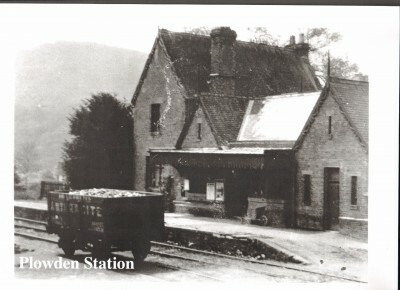 Interesting that both Eaton station and Plowden were manned by ladies. 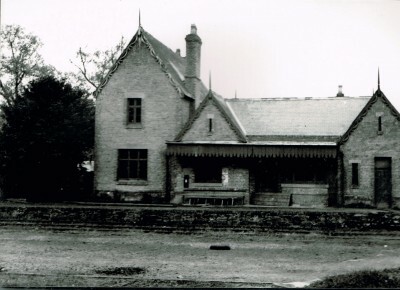 Eaton was a Mrs Annie Bason who in 1931 had been there for a quarter of a century. (According to the News of the World) That must be another story. 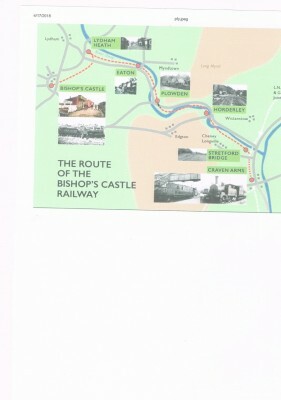 Route of the Bishops Castle Railway from Craven Arms to Bishops Castle.